In a large pot of boiling salted water, cook the pasta until al dente. Drain the pasta, reserving 1/2 cup of the cooking water. Meanwhile, in a small bowl, combine the cheeses. Return the pasta to the pot. Working quickly, add 6 tablespoons of the reserved cooking water, 2 tablespoons at a time, alternating with the cheeses; toss well to thoroughly coat the pasta between additions. Sprinkle on the black pepper and season the pasta with salt; toss again. 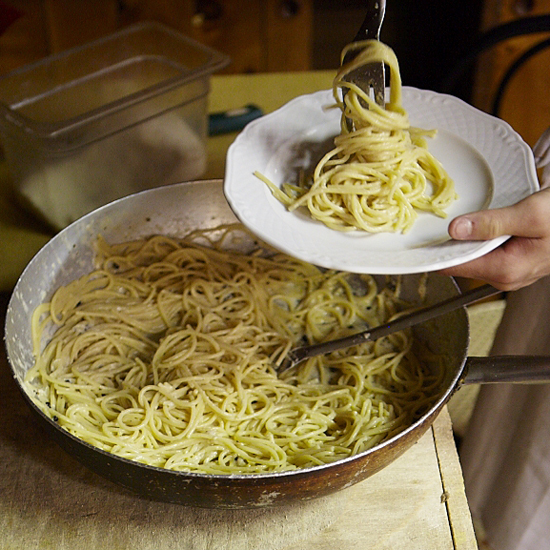 Transfer the pasta to a warmed serving bowl. Add the remaining 2 tablespoons of cooking water, as necessary, tossing until a creamy sauce forms. Serve right away. A crisp Frascati would be a classic partner for this pasta dish.